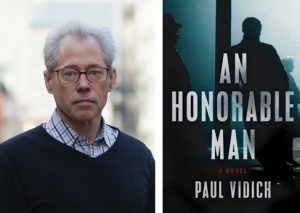 Paul Vidich ’72 is first-time author of the noir spy-thriller An Honorable Man, garnering rave reviews. The novel is set in 1953, in the midsts of McCarthyism, and with the Cold War underway. Vidich’s hero, George Mueller, is assigned to help the CIA find the double agent in its midst who is selling secrets to the Soviets. Read the excerpt published in Poets and Writers here. Prior to this novel, Vidich has written both fiction and nonfiction pieces that have appeared in the Wall Street Journal, Fugue, The Nation, Narrative Magazine, and elsewhere. His story, “Falling Girl,” was nominated for a 2011 Pushcart Prize and appeared in New Rivers Press’s American Fiction, Volume 12: The Best Unpublished Short Stories by Emerging Writers. A College of Social Studies major at Wesleyan, Vidich previously served as executive vice president in charge of global digital strategy at Time Warner’s Warner Music Group. A past member of the National Academies committee on The Impact of Copyright Policy on Innovation in the Digital Era, he testified in Washington before rate hearings. Vidich is currently a venture investor and serves as an advisor to Internet media companies in video and music. He is on the boards of directors of Poets and Writers, The New School for Social Research, and the Elizabeth Kostova Foundation. A former trustee of Wesleyan, he received a Distinguished Alumni Award and is a graduate of The Wharton School.